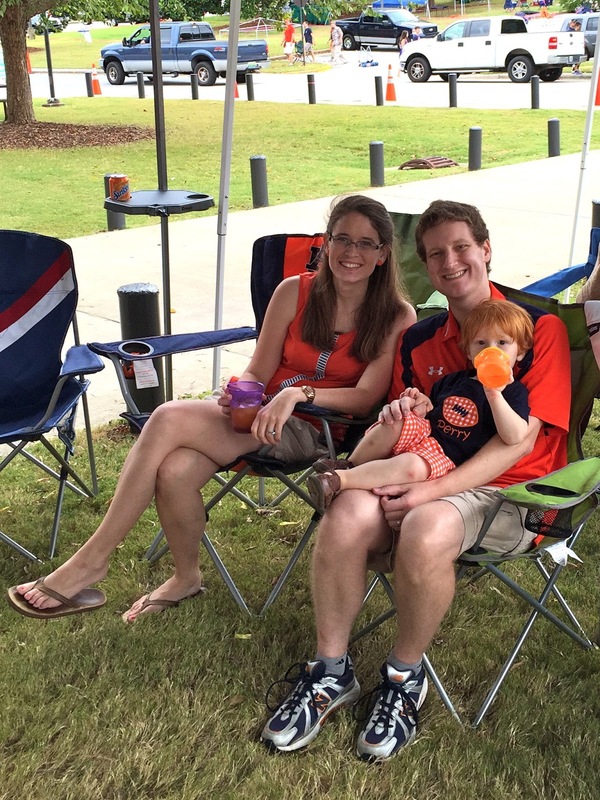 We didn't go into our planning wanting to make sure we were back in Auburn for homecoming weekend, it just kind of happened that way with our schedules. It turned out really great though with the added parade and festivities and just lots of Auburn fans around making it feel like a big game weekend (minus obnoxious away team fans). 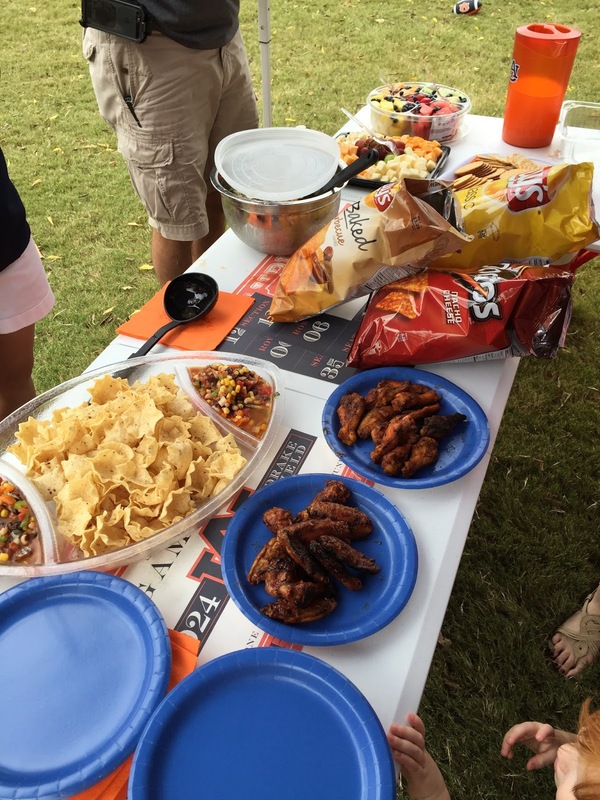 Kickoff was set for 3:00 pm which meant we had time to tailgate before and after the game. We all got to our tailgate spot about 10 in the morning and the boys immediately fired up the grill to make some bacon for breakfast and get the wings started for lunch. We had our TV and a dish so we could watch Gameday and other games on TV while we sat around and talked, and ate. Some nearby tailgating fans came over at one point to borrow our lighter. Thats when you know you have made it in the tailgating world...others come to you for help and supplies. We had a yummy lunch of wings, fruit, cheese, dip, pasta salad and tons of desserts. Each girl just brought a side or two and the boys promised us they would handle the main course meats on the grill, and they did not let us down. 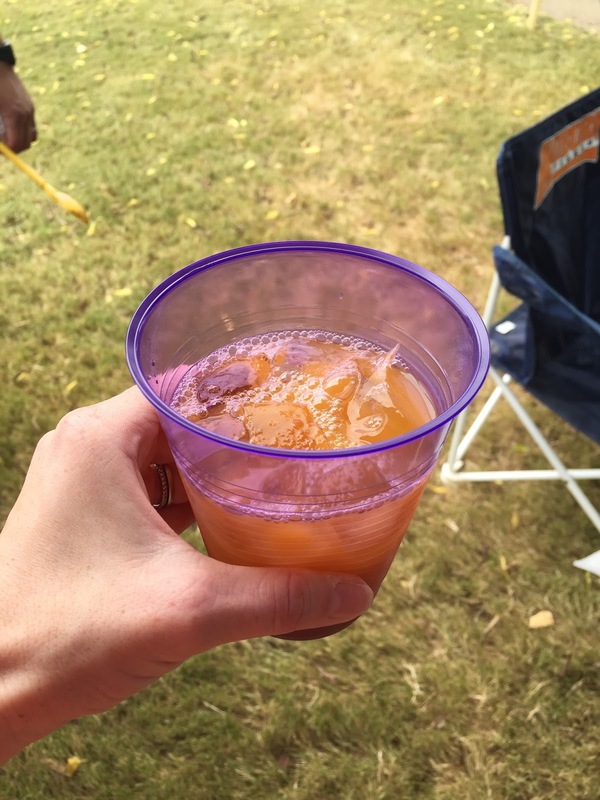 We decided at dinner the night before to create some kind of signature drink for the tailgate and ML came up with a concoction with Tang and pineapple juice. It was yummy and sweet and kind of tasted a lot like a mimosa. Best part was that it was orange, and became affectionately known as a "fuzzy aubie." There is not much just sitting and watching football on TV when you have an active toddler running around. We figured as much and had bought Perry a little football so we could run and play with him. 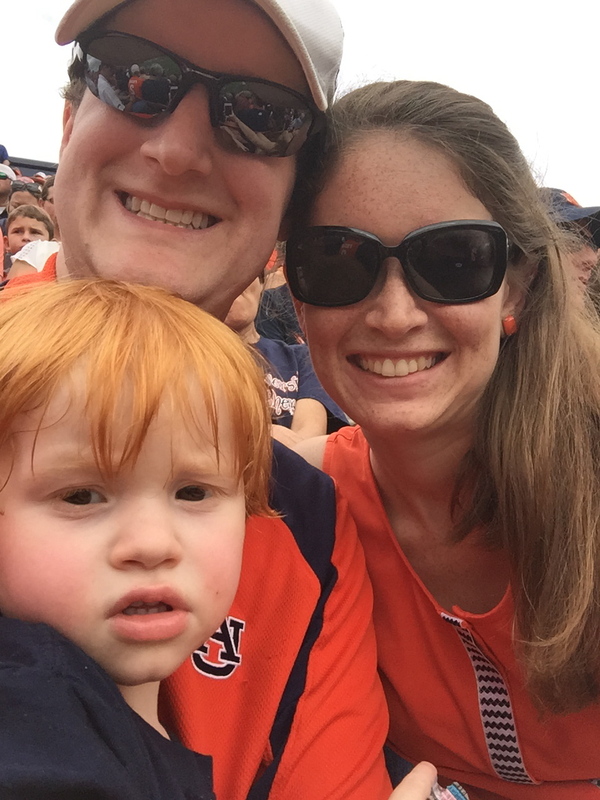 Our friend Meredith was in Auburn with Elliott and some of their church friends. She stopped by the tailgate for a few minutes to say hello and see P (and us). 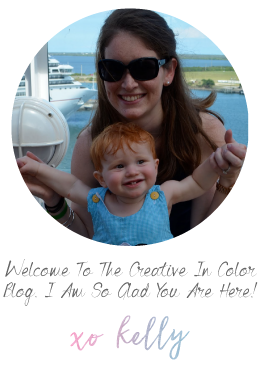 So happy to see her, however briefly. We went into the game about 2 so we could see all the pregame festivities. It never gets old seeing the eagle fly out from the north endzone and make his circles around the stadium to get pregame started. 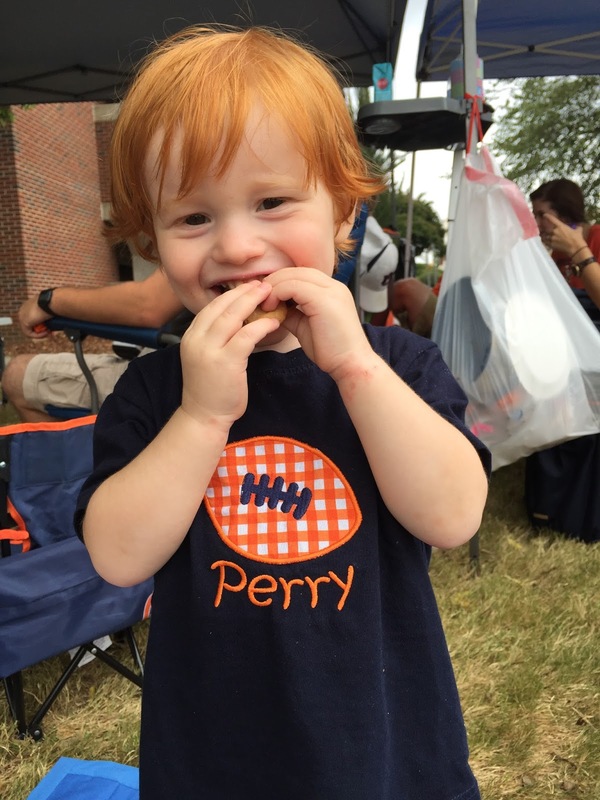 Perry did pretty spectacular during the game considering he had zero nap that afternoon. We tried a little during the tailgate to stroll him and see if he would go to sleep, but there was just too much activity going on for him to have any interest in napping and potentially missing something. We had a block of 9 seats all in a row in the lower deck north endzone, which gave some space and additional people for Perry to play with during the game. 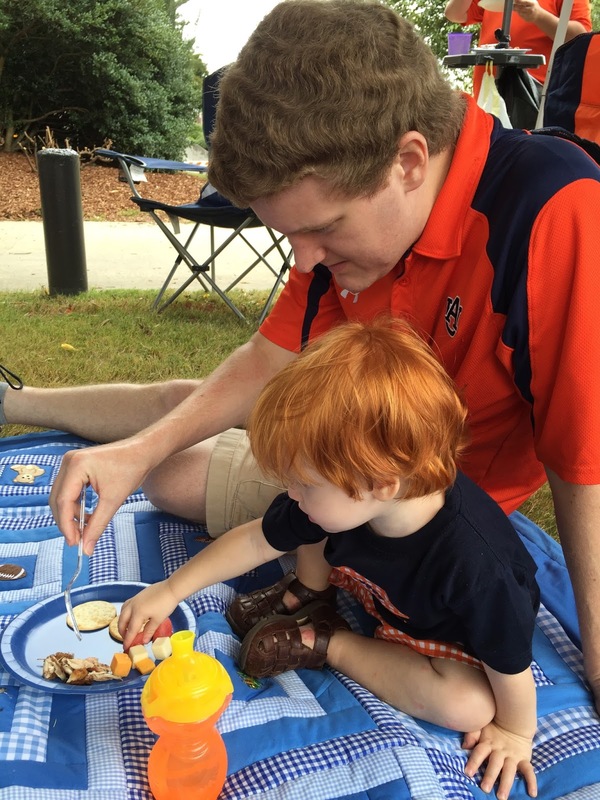 He spent most of the time in either mine or Andrew's lap playing with a shaker, eating snacks or watching the game. He got a little squirmy right around halftime so Perry and I spent most of the third quarter across the street in the student center watching the game on TV, enjoying the air conditioning and letting him get some wiggles out. We went back into the stadium for the fourth quarter to celebrate the win with Andrew and our friends. I'm not sure about bigger games, but no one was patrolling the gates in the fourth quarter and we didn't even have to explain why we were coming back in. People were just walking in and out at will. It was a great game. The weather was perfect and our tigers won pretty big over the LA Tech Bulldogs. We are now about done with the easy cupcake games for a while and will probably have much more stressful games ahead. It was nice in person to just be able to enjoy being there and watching the game without really worrying about whether we would pull out a win. And God treated us with a beautiful orange and blue Auburn sunset to top of the evening. What a difference one year makes. Look at that little baby in the stands with us last year compared to the big toddler this year. After the game we went back to the tailgate spot for dinner (steak fajitas on the grill) and Andrew strolled Perry for a few minutes before he fell fast asleep in the stroller. This allowed us to stay and hang out and watch a little more football on TV with everyone before going back to our hotel for the night. 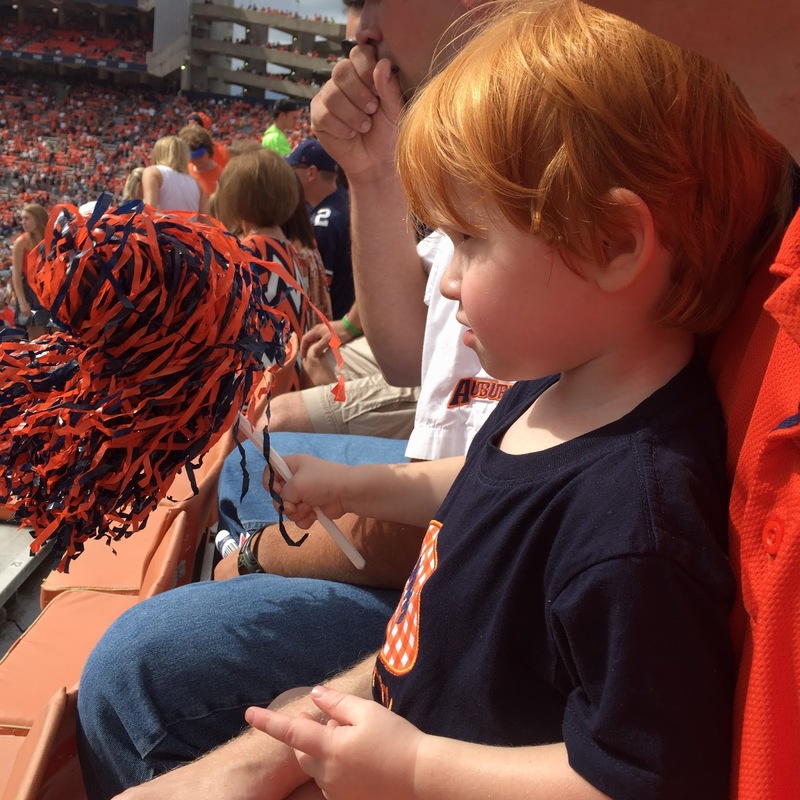 It was a near perfect Auburn weekend. I am so so glad we were well enough (minus some lingering sore throats) to go and experience it. It was a happy homecoming! Looking forward to another trip down on the plains in a few weeks. War Eagle!